10. Sno-Caps: Not many candies think to incorporate sprinkles, which is pretty genius as they add a satisfying crunch to these tiny chocolate morsels. 9. Milk Duds: Aside from peanut butter, caramel is the second best addition to chocolate (personal opinion). A fair warning, though: If you have dentures, you might wan to steer clear of these babies. 8. Mike and Ike: These fruity candies would be higher — but they’re lacking a little something…sour (see number 1). 7. Skittles: Who doesn’t like Skittles? Don’t answer that; I donâ€™t think I want to know. 6. Twizzlers: Or Red Vines, depending on your theater. But only the classic strawberry twists will suffice. No other flavor matters. 5. Goobers: The only thing better than peanuts? Well, aside from peanut butter? Peanuts dipped in milk chocolate. 4. Junior Mints: They’re dark chocolate pieces with a peppermint filling; they taste sweet while freshening your breath. And I normally don’t like mint-flavored foods. 3. Raisinets: Normally, you wouldn’t associate raisins, a fairly healthy snack, with a night at the movies. But chocolate-covered raisins? That’s quite a clever way to make sure we eat our fruits, Nestle. Well played. 2. Buncha Crunch: The deliciousness of a Nestle Crunch bar in bite-size form. Also, if you splurged on candy and popcorn (big spender, you), a couple of Buncha Crunch bits make a great addition to a handful of popcorn. 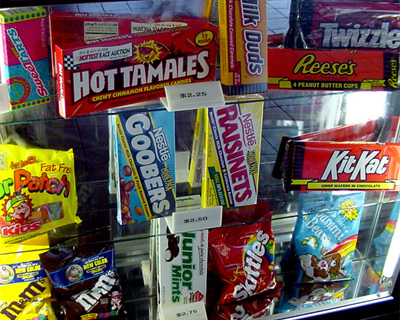 So what do you think – what’s your favorite movie candy? Did we miss any? Great choices. I would move Goobers to # 1, since they are my favorite movie snack. They also go well with salty, buttery popcorn. The first time I had Sour Patch Kids was the first time I went to the movies without my parents. My older sister took me, and she got us some Sour Patch Kids. I now always associate them with movie theaters. Nothing like going out to the movies and getting a tasty treat. For me junior mints are my weakness.